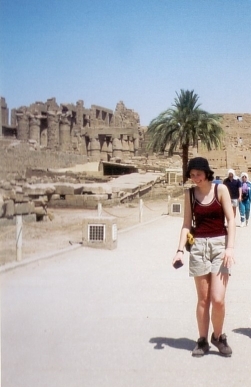 A young, happy me in the temple complex of Karnak. You can see the Hypostyle hall in the back (left). Back in 1999 I was in my senior year of high school. We could choose our senior trip ourselves. It had to be something educational, and the whole class needed to attend the trip. After some brainstorming, we came up with Egypt. And so it was that we set off to discover the temples along the Nile between Luxor & Aswan. It was my first big trip abroad. I had only ever left the safety of Belgium and the Netherlands once, to go to Santorini in Greece with my godfather. Needless to say, this journey made a big impression on me. Our first stop was the majestic temple of Karnak. Both temples in Luxor form a Unesco Worldheritage site, along with the Valley of the Kings & Queens – which we visited on our last day of the trip. In Ancient Egypt this whole area formed the city of Thebes, dedicated to the god Amun. 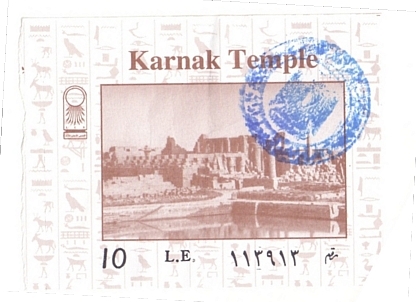 The complex of temples at Karnak was actually built over a period of 2000 years (2055 BC – 100 AD). 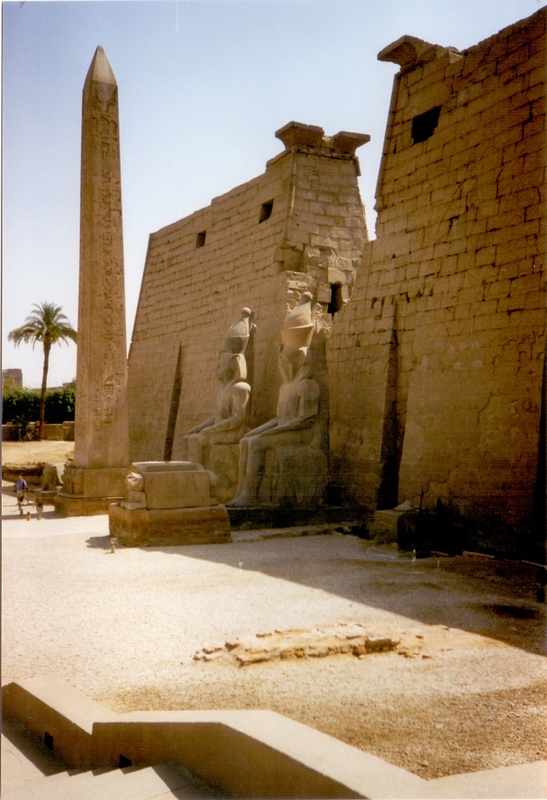 The temples where dedicated to Amun, but also to Mut and Konsu. 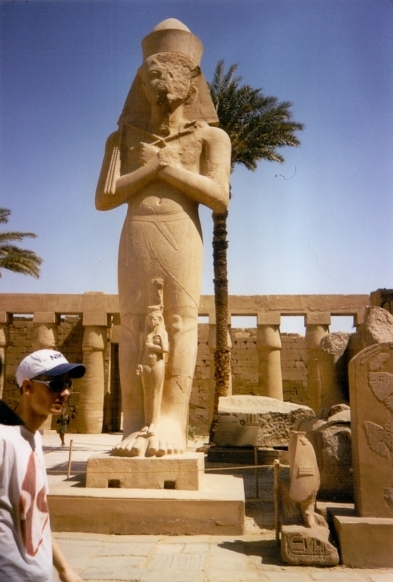 The largest complex was dedicated to the god Amun. To give you an idea of the size of this temple, you must try to imagine the St. Peters basilica in Rome, the cathedral of Milan and the Notre-Dame in Paris – next to eachother. They could all fit comfy inside it. The rest of the complex consists of a large, sacred lake and smaller temple complexes. Around the sacred lake there were storage rooms and living quarters for the priests. During Egyptian times an annual festival was held, celebrating the god Amun. 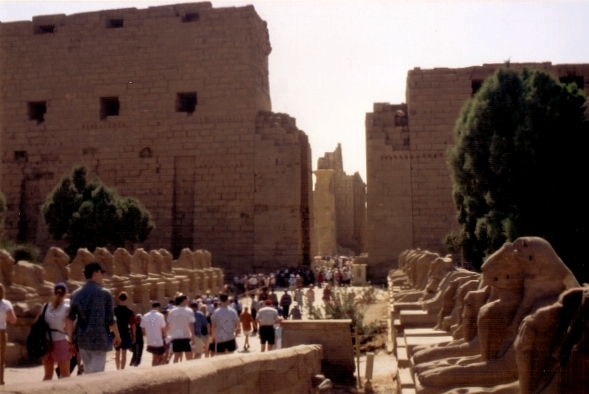 A procession took place, leading from Karnak to Luxor temple, which is situated about 2,5 km away from this complex. 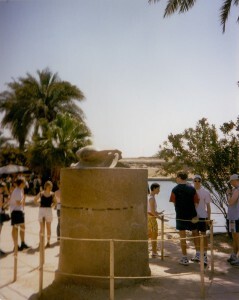 A line of small sphinxes marked the road connecting the two temples, part of which can still be viewed at the temple of Karnak and Luxor. The complex of Karnak is so huge that you can easily spend half a day walking around it. Be sure to take a guided tour. All our visits where guided and there is so much you can learn from the guides – it is well worth it! 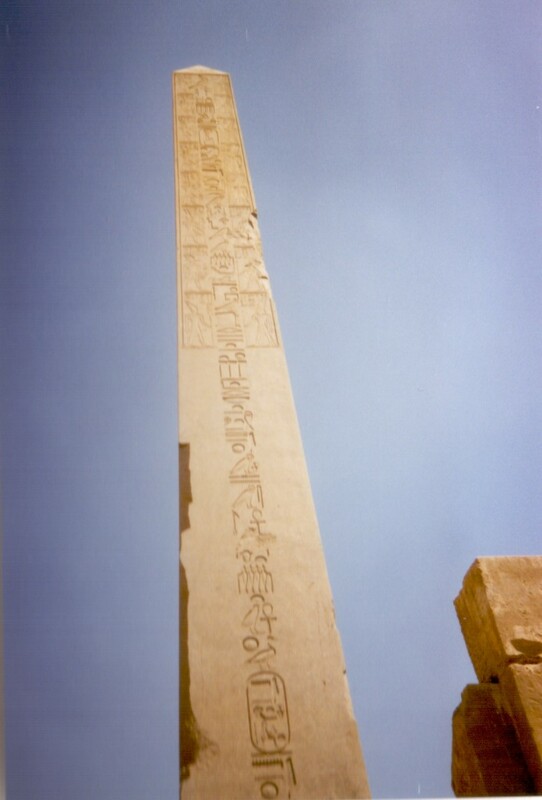 An obelisk at the Karnak complex, near the entrance of the Hypostyle hall – the central part of the complex dedicated to Amun. My first shot of hieroglyps. 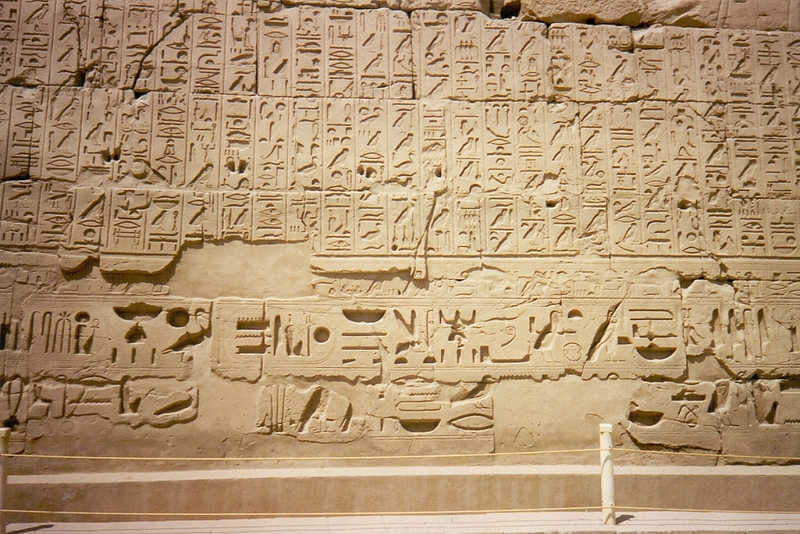 You have two types: carved into the rock, like shown here – or carved out of the rock, as you will see in later posts. The sacred scarabee on the left stands in front of the sacred lake. Legend has it you have to walk around it 7 times clockwise to make a wish come true… Something we all did ofcourse. On the right my entrance ticket to the temple complex. Part of the sphynx lane that connected the two temples. This smaller temple, situated about 2,5 km from the Karnak temple complex, dates back to 1392 BC. Like almost all big complexes in Egypt, multiple pharaos built this one: Amenothep III started the building, while the famous Tutankhamon and the lesser known Horemheb completed it. Later on, Ramses III made some additions. The temple has an impressive entrance, thought not the most impressive one I encountered on my journey along the Nile. On the left you can see one of two obelisks that once stood there. The other one has been seen by far more Europeans: it stands on the Place de la Concorde in Paris. When inside one of the two courts you feel very small in between the huge statues surrounding you, along the papyrus columns supporting the upper part of the courts. It was an impressive first day, emerging ourselves in what life in Ancient Egypt used to be. For the following nights we would retreat onto the MS Florence (what’s in a name…), a 5* cruise ship that would take us overnight to the next temple. I discovered that the views on the Nile and the dessert behind them where quite addictive to me. My fascination for this kind of landscape began back then and hasn’t ceased yet. Setting sun on our first night. Thebes used to be the capital of Egypt (Middle and New Kingdoms). The temples of Karnak & Luxor and the Valley of the Kings and the Queens serve as excellent examples of the Ancient Egyption civilization. 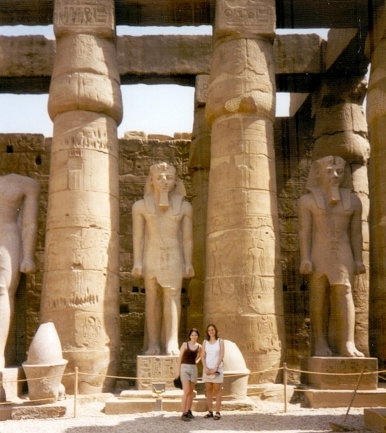 The temples of Luxor and Karnak is a fascinating place. I think you have enjoyed a lot visiting around it.